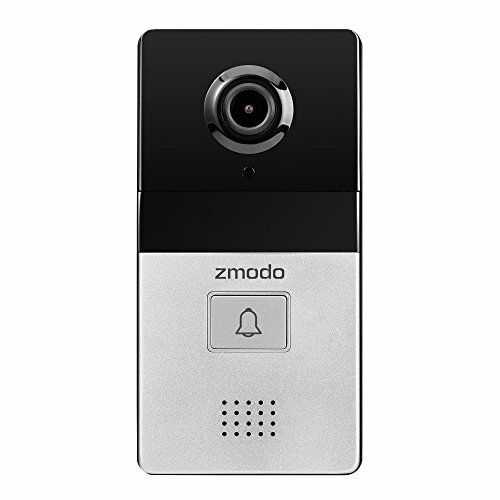 Zmodo Greet Select 1080p WiFi Video Doorbell Package gives your home a 24/7 full protection. With wide view angle, advanced motion detection and instant alert, you won’t miss any visitor. With the Zmodo App, you can view live footage remotely, anytime, and receive alerts with a short video clip whenever motion has been detected. 【1080p Full HD】: With 1080p color sensor and wide angle lens, this doorbell delivers a crystal clear and wide angle live stream of your entire front door. 【Answer the Door】: Simultaneous 2-way audio allows you to talk with your visitors directly via your smartphone and tablet anytime and anywhere. You also have the option to deliver a prerecorded voice message instead if you are unavailable for the ring call. 【Instant Alert】: Receive an instant motion alert with a 10s video clip instead of merely images when the doorbell detects motion, meaning that you can learn about the whole process of any movement in front of your door. 【30-Day Cloud Service Free Trial】: This doorbell comes with a free trial of 30 day cloud service. With Cloud Service, you can review, customize, save, share the footage, or have a flashback of all-day details in just few seconds. 【Additional Free Services】: This product also includes a 60-day return policy, 3-year Zmodo warranty, lifetime US-based tech support by phone, 24/7 Live Chat with a real Zmodo representatives.